So many birthdays close together… Well I guess with a large family already, when you add friends and extended family the number of days between birthdays becomes few. When I asked my mum what she’d like for her birthday dinner, she replied “Whatever you’d like to make”. Just like last year and the year before and the year before…. Place carrots, potato and sweet potato in a saucepan with water and bring to the boil for 5 -10 minutes until almost cooked. Heat oil in a saucepan over medium to high heat and add chicken stirring until brown. Add butter chicken sauce and heat through. Add drained carrots, potato and sweet potato and cook until sauce has thickened a little. 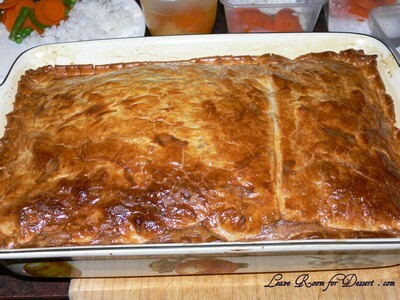 Line a lasagne dish with shortcrust pastry, add chicken mixture and cover with puff pastry. Slice some holes in the top of the pastry and brush with beaten egg. Cook for 30 minutes in oven or until pastry is golden brown. 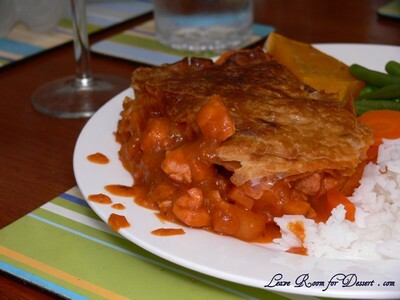 butter chicken – yum! in a pie? even better! that sounds (and looks) absolutely delicious. and i totally empathise with the whole “what do you want for dinner?” “oh anything” issue. last year we made our mum a variety of things because all she would say was “mexican”. This is such a nice idea. You get to eat butter chicken and pie at the same time – brilliant! I like the way you have sweet potatoes in it too. I thought making a butter chicken pie was a little strange when Nick first suggested it, although it really works well. Shez – I’m glad I’m not the only one who gets told “anything” when asking what someone wants. I bet you had a great dinner with a variety of Mexican foods. Lorraine – Thanks for the Happy Birthday message for my mum – she had a great night. Butter Chicken (Chicken Makhani) is one of our favorite Indian food entrees. Making it as a pie sounds like a delicious alternative!